I just finished reading A Light In The Window, Julie Lessman's self-published prequel to her Daughters of Boston series and it is Fabulous!!! Lessman brings her characters to life and every time I read her books, I never fail to both giggle and get teary-eyed. If you've read her other books and have always wanted to know Marcy and Patrick's story, you'll love this book! If you HAVEN'T read her other books, then I highly suggest picking up this affordably priced e-book to get a taste of Lessman's writing. She's one of my favorite authors in the CBA market and I really enjoyed this story. Click HERE to find out how you can win a Kindle Fire, gift cards and more!! Who is your favorite romance author? My book Love On The Range is almost out of print! Amazon says they have 17 copies left...I don't know what that means for the other booksellers but I think it means my print run is almost up? Hmmm. Print runs, returns, those are things that makes this writer's brain shudder. Amazon also has my book on sale, so if you didn't get a copy but are interested in reading it, now might be the time to get it? Last year around this time I was involved in a horrible accident in which I walked away unscathed while a young man was severely injured. So this Thanksgiving, my shoulders feel a little lighter. Many times we're reminded to be thankful for the little things in our lives. Today I am wondering what big things, what deep worries of the heart, what trials have you survived or been rescued from? The publishing world has been evolving for a few years now. It's exciting and full of uknown possibilities. Recently Huffington Post published an interesting article on how e-books are making print books more valuable. Zondervan has also opened a new digital publishing venture. No advance but their e-books will be affordable and their royalties are comparable to other e-publishers. What I would pay for a hardcover (which I very rarely buy) and an e-book is radically different. How much would you pay for an e-book? With the advent of e-readers, is e-publishing more of a realistic publishing opportunity in your opinion? Coming Up: Some Rocking New Titles! My To-Be-Read list is crazy long, but I have two books that I'm salivating to read. Okay, okay, I all ready got to peek at one in manuscript format (heehee!) but my hands are itching to hold it for a reread! 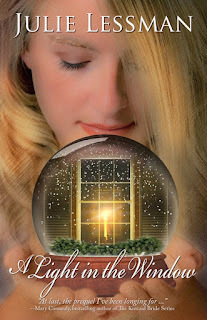 Sometime before Christmas I'll be reviewing the amazing Julie Lessman's new book A Light In The Window. I'm a big fan of hers (my reviews HERE and HERE) and can't wait to read Marcy and Patrick O'Connor's romance.